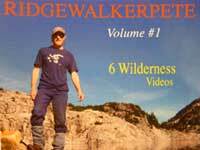 RidgeWalkerPete: Sasquatch revealed at last? 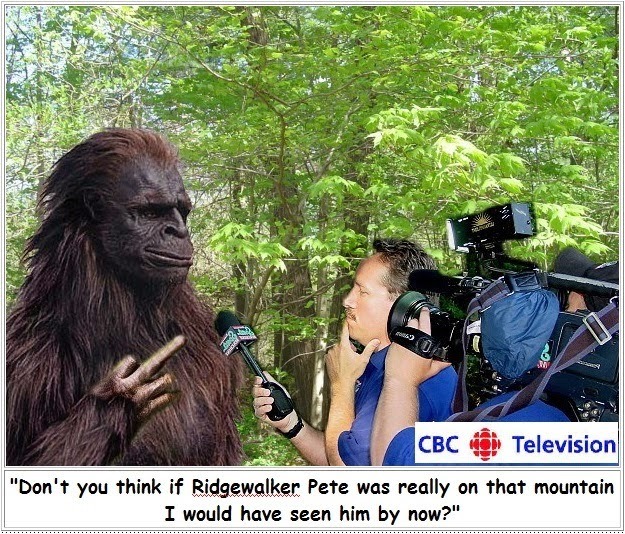 A few days ago I noticed that the Myles Lamont video of a possible Sasquatch sighting had a huge amount of activity so I decided to contact CBC news Vancouver to help clear this up. The next day Belle Puri and Robb Douglas came down to interview me for the evening T.V. news and I also did as a couple of radio interviews including the 'Jack FM' morning show. That snappy owl shirt was made by my wonderful mother. I love you mom. I didn't even have to operate the camera this time. Big time show biz! This story has been going around the world and I was told about some discussion on other bogs including one in Italian. It is great hearing from people from so far away who enjoy this. The truth getting out there. I haven't yet finished the video I shot on Tricouni in 2011 because the story felt incomplete. I didn't get to any of the peaks,wondered around the snowfields and small patches of forest for 6 days taking photos and video as well as looking for my lost water bottle [see 2011 blog entry ]. Now, at last I have the rest of the story. Important update by the ever-clever Steve Tennant.